The weather, on which an out-door function is so entirely dependent, was magnificent; and the attendance on the occasion was large. Admission was by ticket, and publicity had been as much as possible avoided; but seven hundred tickets were distributed, and there were hundreds of applications besides. St Aloysius’ was to be the new centre of the Jesuit mission in Oxford, and this important occasion marked, for the small congregation, an end to worshipping at their ‘out-of-the-way dreary little chapel of St Ignatius’ which had been built by Fr Charles Leslie SJ in 1793, little dreaming that it would have to suffice for a further 80 years. A small mission of the Society had initially opened at Waterperry, c1750, which formed one parish with Britwell and Oxford, and it was when Oxford was created as a separate parish that Fr Leslie built his chapel. Although a plain and humble structure, St Ignatius’ chapel was considered a great thing in its day, and its opening a prodigious event. It was there that, on the 12th of October 1845, John Henry Newman heard Mass for the first time. The first half of the 19th, however, was a time of poverty for the mission and it was proving unproductive: in 1839 there were only 130 communicants and no more than 118 in 1859. That year it, along with several other small missions, was handed over to the respective dioceses to be served by secular priests. One such at St Ignatius’, Fr Alexander Comberbach, purchased the land opposite Christ Church with a view to build a modest Gothic church to the Immaculate Conception, while Newman planned to found an Oratory in Oxford and so purchased the land that is now Wellington Square. In the end, neither of these plans came to fruition, with the result that in 1871 Dr Ullathorne asked the Jesuits to resume charge of the mission. The old chapel being inadequate to the wants of the congregation, and inconveniently situated, it was decided to build a new church and a new site was purchased in Woodstock Road thanks to an unexpected legacy of £7,000 from Baroness Weld. The architect appointed was Joseph Aloysius Hansom, who had previously designed the Jesuit Church of the Holy Name in Manchester, and would go on to design St Walburge’s, Preston. St Aloysius’ was solemnly dedicated on the 23rd of November 1875 by Dr Ullathorne, with Cardinal Manning preaching the sermon. 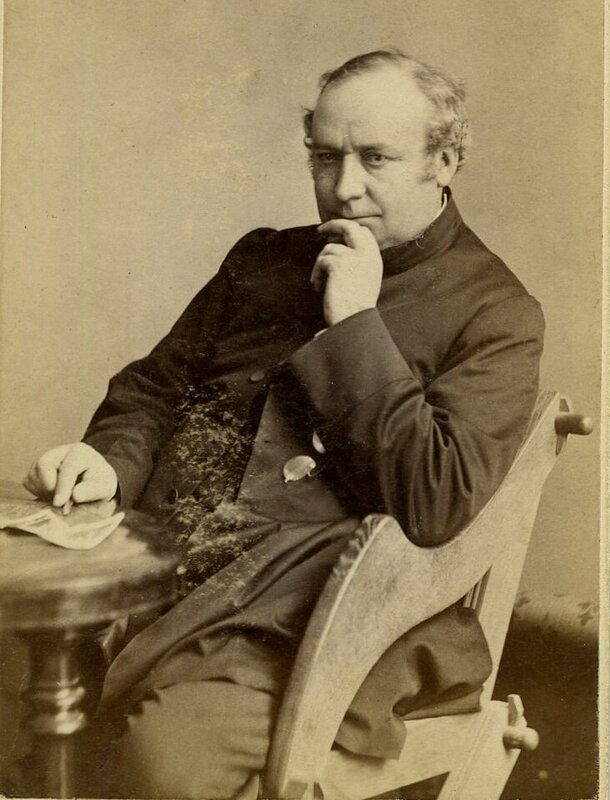 Fr Thomas Parkinson SJ had arrived in October 1875 to take charge of the mission, and would go on to serve it for twelve years. By the start of 1876 Fr Parkinson had purchased the houses adjoining the church with the aim of creating an open approach to the church and space for an adequate hall or parish rooms, and rooms for the community to move into. By the end of their first year, Lord Bute had given £1,000 for a new altar and 34 converts had been received. Over the years St Aloysius’ congregation would hear many of the day’s most distinguished preachers: Cardinals Newman and Manning, Fr Basil Maturin (who lost his life on the Lusitania), and Frs Bernard Vaughan, Cyril Martindale and Martin D’Arcy SJ. For many years a distinguished member of the parish was Hartwell de la Garde Grissell, a Papal Chamberlain and founder of the Oxford University Newman Society. 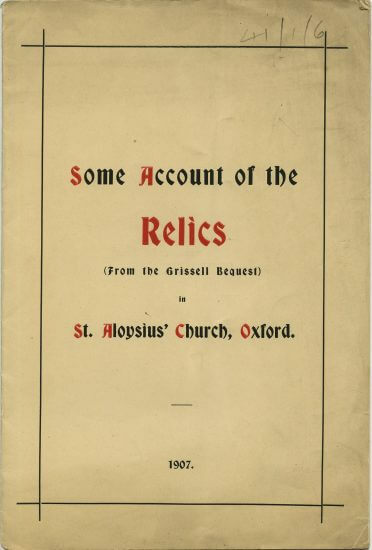 When he died in June 1907 he left his entire collection of relics to the Catholic Archdiocese of Birmingham, on the condition that it be housed within a special chapel in the church. 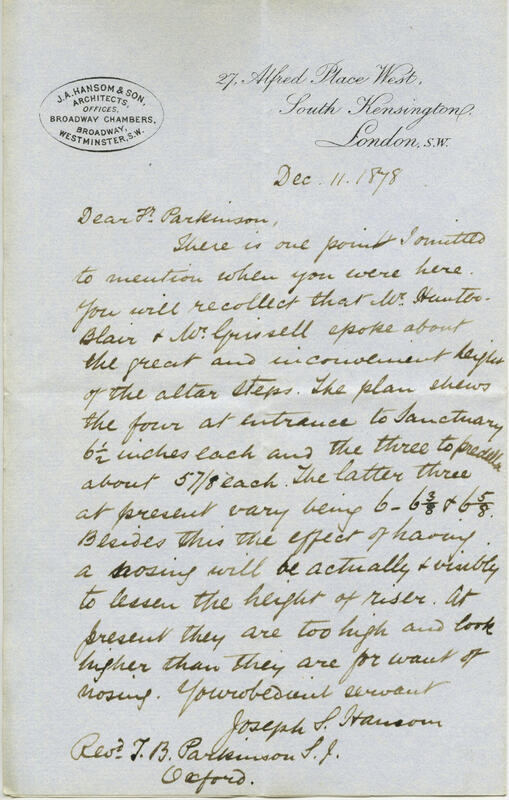 With only two months to provide a chapel and sacristy for the relics, Fr Arthur Day SJ (then Superior) sent appeals to friends of the church and letters to the press. Over £350 was raised and the baptistry speedily converted into the required chapel and a small sacristy was built on. The relics included those of over a hundred martyrs, four primary relics of St Philip Neri, founder of the Oratorians, and of St Ignatius, St Francis Xavier, and other Jesuit saints. In the 1950s the decoration of the church was simplified to concentrate attention on the altar and a parish hall was constructed above the school next to the church. When the altar was moved forward in 1966, dry rot was found under the sanctuary, requiring extensive repairs. In the mid-1970s Fr John Costigan had the church re-painted in more cheerful colours (it had been painted grey during the renovations in the 1950s), and this colour scheme remains today. 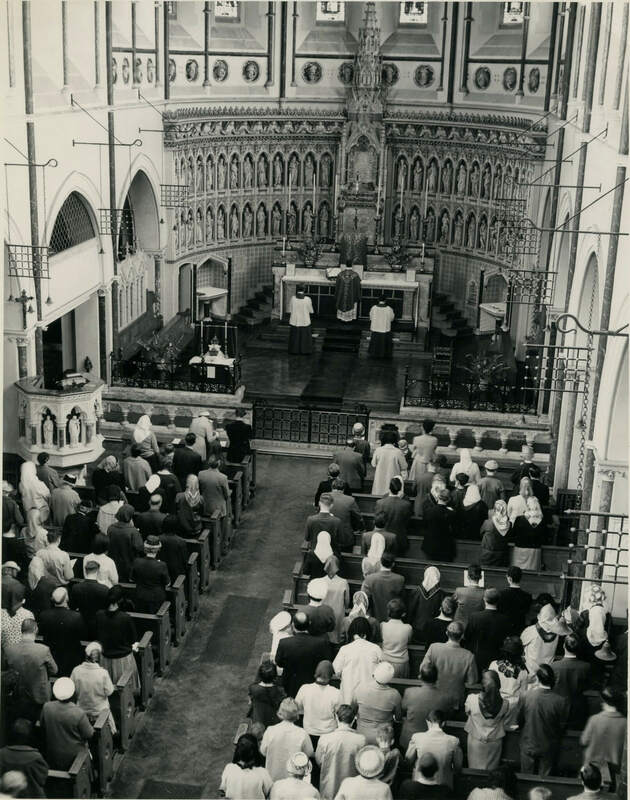 By this time, however, the Society felt they could no longer look after the parish and so in 1981, the church was handed back over to the Archdiocese of Birmingham, which looked after it until 1990 when it was entrusted to the Fathers of the Oratory. 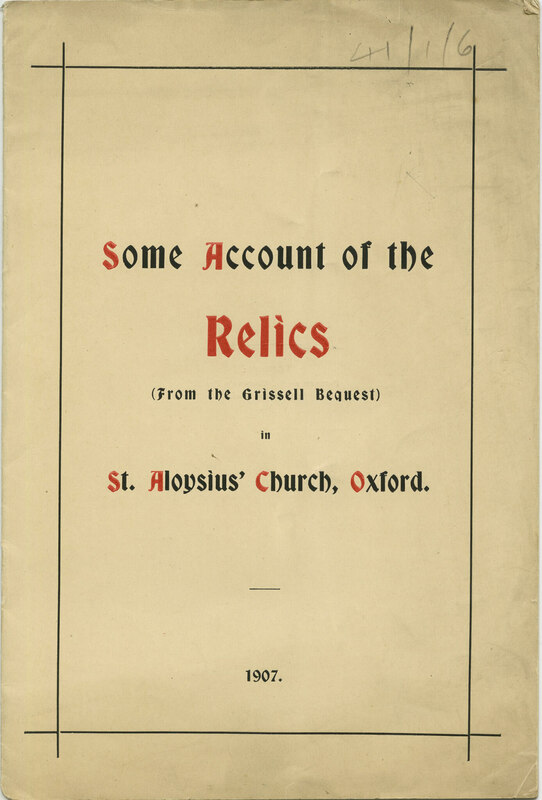 If you are interested in St Aloysius’ and would like to know more about the archives we hold, or about the work of the Jesuits in Britain Archives in general, please contact us.